find a car park! make doctors’ appointments! follow the pros! find a property! check the weather! follow bloggers! chat with your communities! get advice from bloggers! check traffic info! work your network! get inspiration! find a job! check your horoscope! find out about the market! 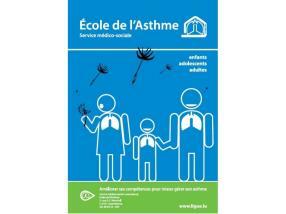 look up duty pharmacies! get good advice! recommend pros! enjoy savings all year-round! give your opinion! prospect effectively! book a table! chat with the pros! look up emergency numbers! find the right contact! explore Luxembourg! check out what’s on at the cinema! Les prestations de la Ligue se font à titre gracieux. 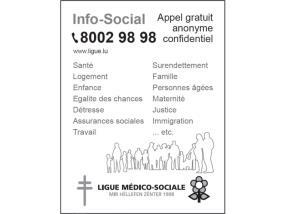 Ligue Médico-Sociale in Luxembourg, full practical information on Ligue Médico-Sociale: opening times, telephone, address. 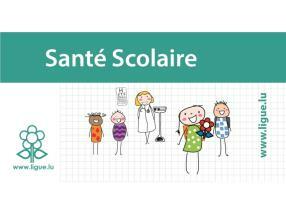 All activities for Ligue Médico-Sociale: Accompagnement social, Advice on over-indebtedness, Consultations for infants, Curatorship guardianships, Health Promotion, Help service, Prevention of respiratory patients, Public administration, Public social service, Public utility, School medicine, Social & paramedical services, Social and medico-social prevention, Social service, Social support, Socio-pedagogical accompanying, Tuberculose. 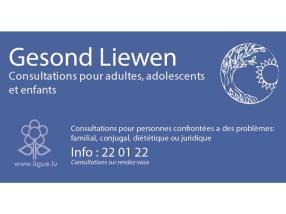 Locate your contact Ligue Médico-Sociale on a map in Luxembourg.